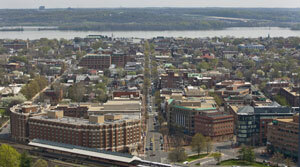 Alexandria is a metropolitan city home to over 100,000 people and is located 6 miles from Washington, DC. Being so close to the capital means that Alexandria has the same advertising and billboard potential. Tourists traveling to the capital take Interstate 95 and Interstate 395, both of which run through Alexandria. This makes billboard ads along these highways a very effective advertising strategy. The tourism lines can also use bus and billboard advertising to attract their target audience. There are also many shopping centers in Alexandria such as the Landmark Shopping Center and Arlandria Shopping Center that can be used for outdoor advertising.